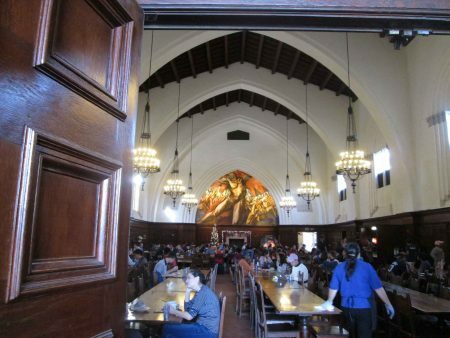 Inside Frary Dining Hall at Pomona College in Claremont, CA, beyond extensive rows of tables and chairs, one encounters a singular sight atop the arched central panel of the back wall: a large 1930 fresco by José Clemente Orozco. Designated Prometheus, this mural depicts its titular Greek titan painted in Orozco’s signature El Greco-esque style. This was the first mural painted in the U.S. by one of “Los Tres Grandes” Mexican Muralists. Students eat in its presence every day. Prometheus inside Frary Dining Hall at Pomona College, Claremont, CA, December 2017. The idea and context of this exhibition are intriguing in numerous ways. 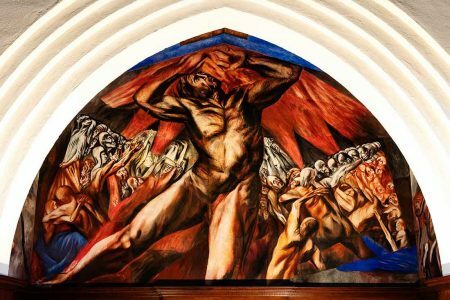 Though considered by many to be a masterpiece and treasure of Pomona College, Orozco’s mural is undoubtedly taken for granted by many of those who dine with it daily. Jackson Pollock made a special trip to see Prometheus; and just outside the dining hall is Genesis, Rico Lebrun’s mural inspired by Orozco’s. The notion of reinvigorating Prometheus by bringing contemporary women artists from Mexico is interesting, especially given that Frary was once a men’s dining hall. Current political controversies surrounding relationships between the U.S. and Mexico; and Pomona College’s status with an art program counting Chris Burden and James Turrell among notable alumni, add to the exhibition bonus cachet. The ingenious concept and lofty funding make it all the more unfortunate that, owing largely to infelicitous curatorial decisions, the exhibition fell flat with regard to its stated aspiration. In theory and in application, this exhibition’s core deficiency was a lack of synthesis among the four contemporary artists and Orozco. The show’s inadequacy began with its title leading one to believe that each of the four artists was inspired by Orozco’s work. “Revisit” strongly implies that Orozco served as a point of departure for each of the four contemporary artists. Furthermore, designating the show as “Prometheus 2017,” along with supplementary discourse of “activating Orozco’s mural by reinvigorating Prometheus,” suggests a direct relationship not only to Orozco, but more specifically to his Prometheus mural. However, only two of the show’s constituents, Isa Carrillo and Rita Ponce de León, evince direct inspiration by Orozco. Carrillo was inspired by Orozco’s persona, not by Prometheus. That leaves Ponce de León as the only artist who could legitimately be said to have actually “revisited” Orozco and “reinvigorated” Prometheus. But all this relates to theory. Such terminological misrepresentations are relatively common. The fact that all the artists’ work did not evince Prometheus‘ influence could easily be overlooked if the show had provided some sort of contemporary context for Prometheus, or even if their work had provided a fresh framework for contemplating Orozco’s work in general. With regard to layout and content, the show was inconsistent and incohesive. Exacerbating the confusion, didactic materials were scanty where needed, and excessive where they lacked clear relation to Orozco, Prometheus, and the contemporary work displayed. Explanatory comparisons between the contemporary work and Prometheus often hinged upon the premise that their work had to do with “political causes,” as in the Getty statement mentioned earlier. The placement of a Mexican mural in Pomona College could be viewed as political; but this is hardly addressed in the exhibition. The Getty’s website states that Prometheus “questions the very idea of enlightenment in a modern world steeped in conflict.” Certainly, Prometheus illustrates a timeless issue, but is the mural’s statement necessarily political? Orozco was involved with political causes, and many of his murals addressed governmental and social issues. For its ambiguity and timelessness, Prometheus‘ content doesn’t seem particularly political, especially when compared to his other murals. Even if we accept that it is, the didactic labels failed to discuss the specific political trajectory of each contemporary artist’s work. All four artists’ works were based upon complex back-stories. Explanations were needed in order for the viewer to understand how individual works and the installation related to each artist’s oeuvre and to Prometheus. Instead, inside each artist’s installation was a single two-paragraph plaque that described her work in general terms. Almost as though they were afterthoughts, titles and media were listed on the same plaque, related to the installation by way of a diagram. That meant that viewers would have to walk back to the plaque in order to find out specific works’ titles and media. Upon entering the show, the first works one encountered were Orozco’s preparatory drawings for Prometheus. The show then led into a room dedicated to Adela Goldbard, who enacts performances with pyrotechnic sculptures and fireworks. Her installation featured three simultaneous videos projected on different walls. Plutarco, Putos (2015) features two men throwing an effigy into a drainage ditch. 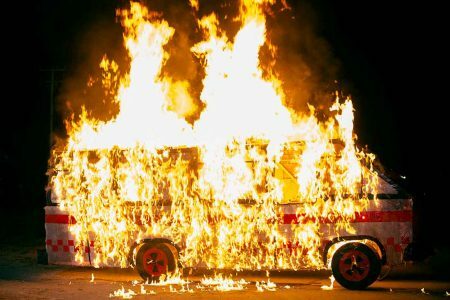 In the other two videos, vehicles burst into flames, revealing their artificiality as pyrotechnic sculptures. The wall label says these are “replicas of vehicles central to acts of political violence in recent Mexican history,” and that her work is based upon “archival research into ‘official’ (i.e. state-sanctioned) narratives of violence in Mexico.” It seems as though this research, the acts of political violence therein, and the state-sanctioned narratives would be interesting and relatable, but no dates nor specific acts are cited. The nature of the “acts of political violence” is never stated—were they terrorist attacks, cartel violence, assassinations of public figures? “Her performances and videos contest the means through which the government and the press manipulate facts to construct an official story and critique the complicity of the United States and Mexico in drug trafficking and organized crime,” the label reads. However, since we haven’t been told what vehicles these are replicas of, nor the events being reenacted, a disjunction between the state-sanctioned narratives and the actual events seems a non-issue. “Goldbard’s work compels viewers to bear witness to violence and injustices,” the didactic concludes. But in these videos, we only see artificial vehicles burst aflame; no one appears to be inside. In fact, the pyrotechnics in the videos seem more celebratory than violent, like effigies and bulls burned at festivals in Mexico. This isn’t to say that Goldbard’s work itself is lacking–on the contrary, it and visitors were disserviced by the museum for not providing a clear backstory. In fact, researching her work after seeing the show clarified her political concepts for me in less time than it took to see the show. Museums should distill such information so that seeing the exhibition provides a foundation for understanding an artist’s work. Learning about the artist online shouldn’t be quicker, easier, and more interesting than visiting her show. A small placard below Goldbard’s label pictures her vehicular sculpture Microbus along with landscape elements inside the show. These formed a prominent part of this installation until their removal for use in her pyrotechnic performance at the college on November 18. This regrettable scheduling decision meant that viewers between Nov. 18 and Dec. 16 didn’t see the full installation. Along with the picture of what was missing, video documentation of the performance might have also been informative. Beyond Goldbard’s installation was an alcove dedicated to an extensive timeline covering two walls. Around the timeline were vitrines containing ephemera related to Orozco and Prometheus, as well as copies of relevant articles. These were more informative than the timeline that occupied a considerable larger amount of space. The timeline ostensibly anchors Prometheus and the contemporary artists “with information on Orozco’s life and work, the Prometheus mural, Prometheus as a discursive figure, the history of Pomona College, and pertinent world events.” An absence of information about the master muralist’s larger oeuvre was most lamentable. Works like The Epic of American Civilization and Catharsis are mentioned but not pictured, leaving unfamiliar viewers in the dark as to the true significance of Orozco’s work and politics. While the timeline contained some biographical information about Orozco, political events were not integrated with his biography. Furthermore, although its last event was this exhibition, the timeline contained no mentions of any of the four contemporary artists, their biographies, or their conceptual concerns. Instead, miscellaneous events like massacres in Mexico, labor strikes at Pomona College, and racial discrimination protests evinced no clear relation to art at hand, serving more to confuse than to illuminate. 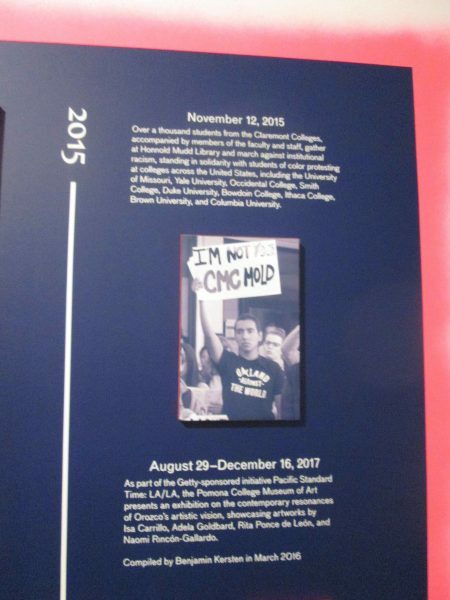 Unattached to the displayed artwork, the timeline’s general theme of activism, Mexican politics, and Mexican-American social issues seemed so broad and generic as to be stereotypical. 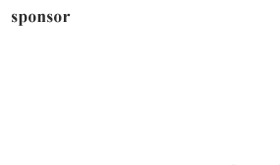 Also, while the timeline mentions issues of discrimination dating from 2015, current issues related to immigration and the border were conspicuously absent. The timeline alcove flowed into Rita Ponce de León’s mural installation. Multiple vignettes were painted on each wall; walking by them had the effect of flipping through a graphic novel. 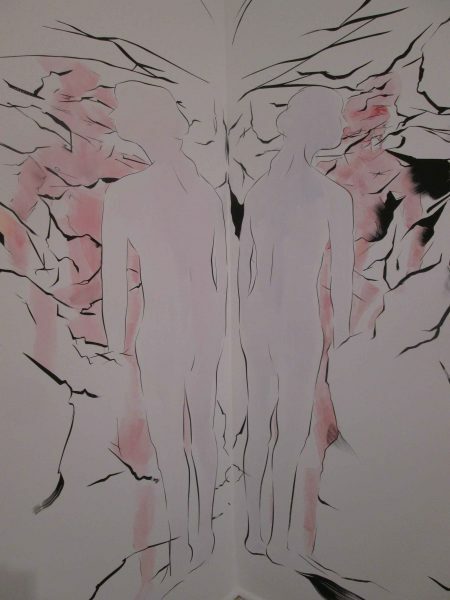 Painted in a contemporary drawing-like style, they depicted figures seemingly inspired by Greek mythology. The label states: “Ponce de León’s project for ‘Prometheus 2017’ pivots on the concept of conversations relayed in a chain of messages. … Ponce de León facilitated a series of meetings and conversations between successive pairs of students from The Claremont Colleges. …After meeting, each pair bequeathed a package of their ideas to the next pair. Ponce de León ‘inherited,’ as she termed it, the entire dialogic chain. This became the conceptual material that fueled the imagery she painted directly onto the museum walls.” The label omits the pertinent fact that one of the questions asked during these conversations was “What does Prometheus mean to you today?” Near a bench inside Ponce de León’s installation is a stack of take-home printouts with phrases apparently from her student collaborations, but of unclear relationship to the imagery. Detail of Rita Ponce de León’s ink mural, “Noor and Davis” (2017) in “Prometheus 2017” at Pomona College Museum of Art. Naomi Rincón-Gallardo’s installation featured Odisea Ocotepec (Ocotepec Odyssey) (2014): an audio installation and nine videos. Featuring eccentrically costumed people in weird situations singing bizarre lyrics, they seemed parodic of popular music videos. According to the label, Rincón-Gallardo’s work “explores the creation of counter-worlds through myth, science-fiction cinema, and protest songs, with specific reference to liberation theology as manifested in Mexico in the 1960s and 1970s.” Sounds relatable. But reading further, one gets lost in references to philosopher Ivan Illich and comparisons to Orozco’s investigations of myths; in order to be graspable, these would need to be backed up by more detail and anchored to Rincón-Gallardo’s specific works. Similar to Goldbard’s work, information on Rincón-Gallardo’s website was more illuminative, detailed, and understandable than this label. 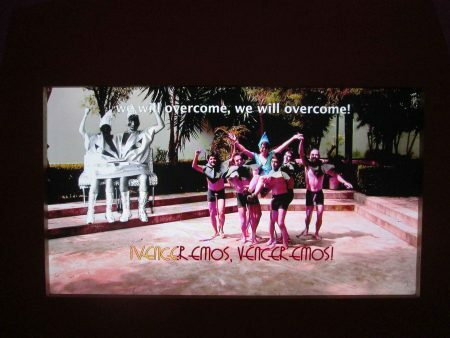 Caption: Video still detail of Naomi Rincón-Gallardo’s Odisea “Ocotepec (Ocotepec Odyssey)” (2014) installation in “Prometheus 2017” at Pomona College Museum of Art. Isa Carrillo’s installation was most esoteric, consisting of slide viewers, microscopes, astrological images and drawings of hands. In total, her artworks were “a symbolic portrait” based upon Orozco’s left hand, which he lost in a fireworks accident. Based upon research she did on Orozco’s personality and palmistry, graphology, and astrology, her back-story sounded very intriguing. Unfortunately, like a fairy tale condensed into three sentences, it was told in such general terms as to be as incomprehensible as the work that it was supposed to illuminate. 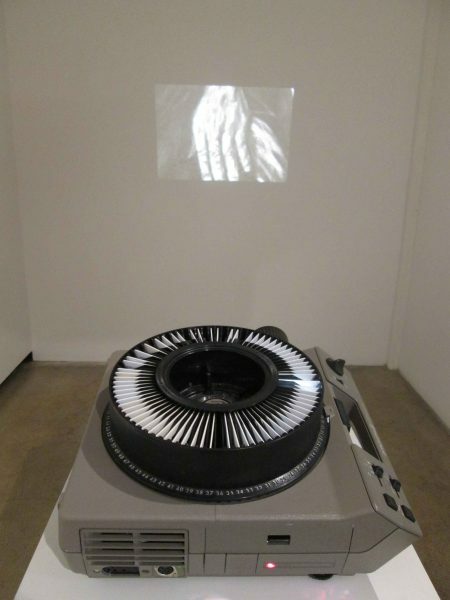 Isa Carrillo, “Suite #1” (2015), transparencies and slide projector, as displayed in “Prometheus 2017” at Pomona College Museum of Art. 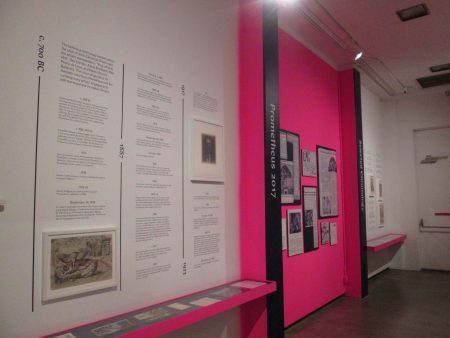 This exhibition’s overall layout of a separate room dedicated to each contemporary artist, with no overlap, is appropriate for sprawling exhibitions like thesis shows and expansive surveys. It can also effectively unite smaller shows whose artists’ thematic relationship is obvious, broad, or relatively unimportant. In order for this format to work in a small, ostensibly tightly themed show like “Prometheus 2017,” the relationships between the artists would have needed to be made clear at the outset; and didactic materials should have supplied a sufficient foundation for understanding each artist’s work. A nearby PST show that successfully integrated three disparate Mexican women artists of different generations was Scripps College’s “Revolution & Ritual: The Photographs of Sara Castrejón, Graciela Iturbide, and Tatiana Parcero.” Each artist’s body of work was kept separate but flowed into the other two, as though in dialogue around the exhibition space. There, detailed labels next to certain artworks, including quotes from the exhibition catalog drew one’s attention to the pictures’ formal attributes and elucidated their historical background in ways that enhanced one’s interest and appreciation of the work. I saw “Revolution and Ritual” after having already researched and written about the artists therein, but visiting in person provided me with information I couldn’t have found elsewhere. Throughout “Prometheus 2017,” plaques provided insufficient basis for interpreting the work and the artists’ relationships. This rendered the show more like that of a relatively unaccountable commercial gallery than an informative museum. It’s part of a larger trend of museums to minimize easily accessible information, and not to dedicate labels to individual works. The thinking behind this is understandable. Wall labels are often boring. Hasn’t everyone felt burdened with the feeling of obligation to read every label? But ultimately, if an interested visitor doesn’t understand the work, and isn’t provided with sufficient background for interpreting it, visiting such a show is so boring and frustrating that one is liable to leave bewildered. In their apparent eagerness to dazzle and entertain visitors, such museums forget that a large part of their purpose is based upon education. It’s worth noting that “Prometheus 2017” included talks by each artist, as well as performances and a catalog. Such auxiliary events usually are informative; but museums should remember that the exhibition is the event around which all supplementary lectures, essays, and performances orbit. If the exhibition itself is uninspiring, why attend a lecture or buy a catalog? An ideal exhibition is one that incites curiosity, furnishes knowledge, and transforms viewers’ opinion of work they didn’t before appreciate for lack of understanding. Conversely, a wanting exhibition means the museum’s potential to enlighten will go uncomprehended and unappreciated, like the fire Orozco’s Prometheus stole from the gods.